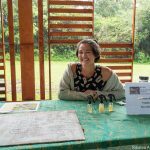 UH Hilo student Alexis Stubbs was motivated to create the project because landfill space on the island is limited and composting is an important part of achieving sustainability on campus. 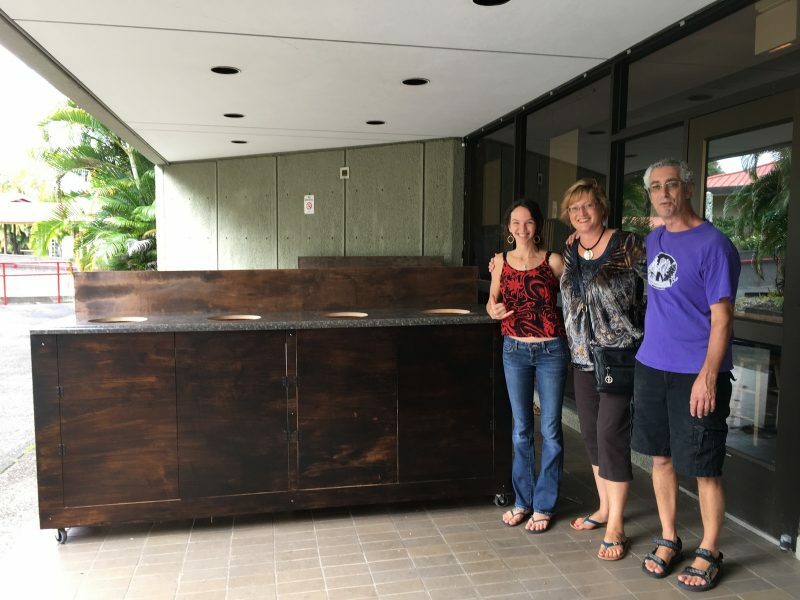 (l-r) Student Alexis Stubbs, Brooke Hansen, co-advisor of the Students of Sustainability club, and Jack Rossen, co-advisor of SOS, stand in front of the new recycling and food waste collection bins recently installed in the UH Hilo Campus Center Dining Hall. The bins were built by the students of SOS. Courtesy photo, click to enlarge. 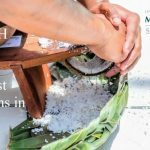 A few months into the 2017 fall semester at the University of Hawai‘i at Hilo, the Students of Sustainability (SOS) club and the campus Sustainability Committee have collaborated with Sodexo and the College of Agriculture, Forestry and Natural Resource Management (CAFNRM) to launch the Food Waste Collection Program. At the foundation of the program are large food waste bins placed in the Campus Center Dining Room that allow students to separate their compostable food waste from landfill waste. 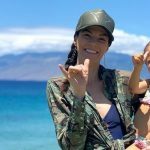 The initiative is led by a team of students, including Kaysee Buchanan, June Talamoni, Logomalu Papalii, and team leader Alexis Stubbs—who created the Food Waste Program and is the UH Hilo Student Association senator representing CAFNRM—and Reid Kusano, Sodexo operations manager at UH Hilo. 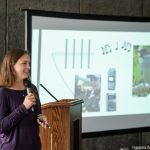 Together, with the help of the Sustainability Committee faculty members Ryan Perroy, associate professor of geography and chair of the committee, Brooke Hansen of the UH Hilo anthropology department and SOS advisor, and others, the group has launched this entirely student driven initiative. Students at the composting site on campus located behind the College of Agriculture, Forestry, and Natural Resource Management. The photo was taken on a recent volunteer day to build new temporary compost bins. Courtesy photo, click to enlarge. Seventy percent of all items that end up in the trash bin are actually compostable and with the Hilo landfill nearing max capacity, many students, staff and faculty are motivated to get involved. “This project’s success depends on campus community awareness and education,” says Stubbs. 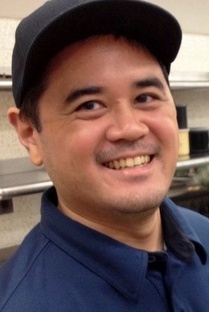 Stubbs approached Sodexo manager Kusano last year on the need for a compositing and waste diversion initiative. Stubbs says that the current method for collection is working but there are improvements that could be made to make it more efficient. In the near future there will be better operation tools introduced. The Food Waste Collection Program is sustained with the help of the student workers, Buchanan, Talamoni, and Papalii. 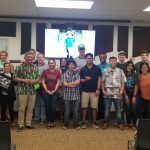 The UH Hilo Student Association, with assistance from the Office of the Interim Chancellor, helps to fund these positions in order to help keep the waste diversion stations clean and sanitary for daily use. The student workers also help educate students on composting and sustainable practices so they can select the correct bins for their food waste. “I was determined to find an alternative solution after witnessing the significant contribution the university makes to the landfill each year,” says Stubbs. The campus is already utilizing compost in several vegetable gardens. 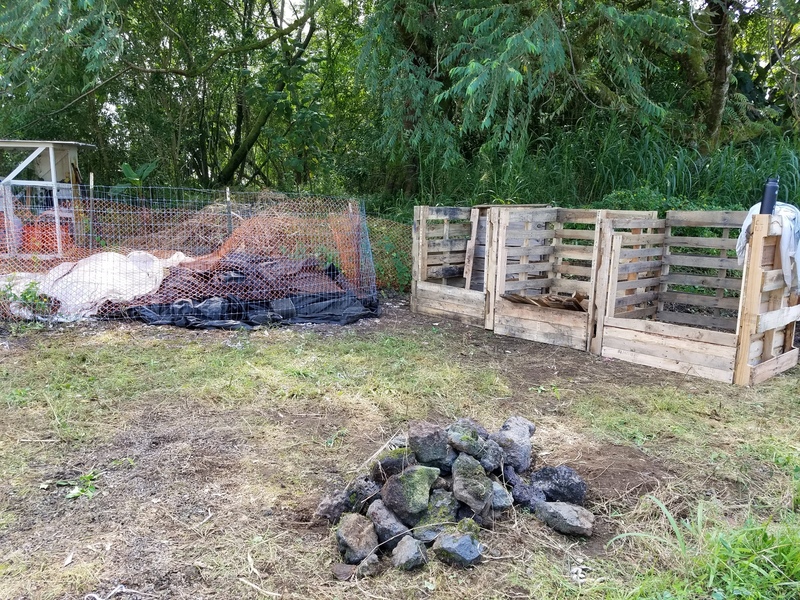 The compost provides a variant of benefits including disease resistance, fertility, increased plant growth hormones, and can help remediate damaged soils. SOS and the Sustainability Committee hope to reduce waste to zero percent by 2030. This initiative and other composting efforts help to achieve that goal as well as increase food production in the campus gardens through minimizing the need for inputs and providing a high quality soil amendment. The project also aims to support the UH System’s EP 4.202 System Sustainability Policy developed under the leadership of UH President David Lassner. 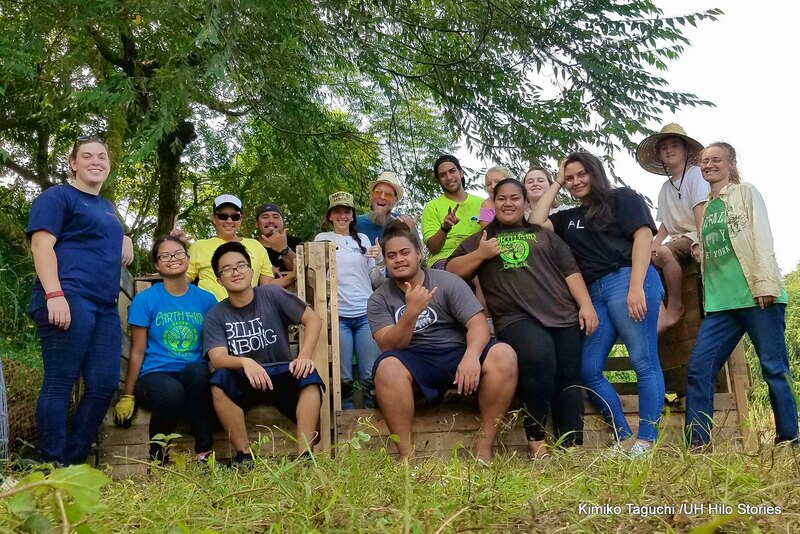 The goal of the sustainability projects initiated at UH Hilo is to model a sustainable food system that island communities can implement to reduce impact on the environment. Stubbs emphasizes that landfill space is limited and with the support from faculty, staff and, most importantly, students, success with these types of sustainability practices is possible.